Is it more work to live with a special needs bird? Not necessarily! Living with a parrot is challenging, no doubt about it. So, does that mean that living with a handicapped parrot is more difficult? Not necessarily! The basics still apply – ample cage space, good nutrition, proper avian vet care, environmental enrichment and safety. With a few adjustments, you can help your bird live fully with its disability. My experience has involved 18 years living with a doubly handicapped Quaker. He came to me with a missing foot. Many years into our journey, he also managed to fall, which resulted in losing his sight in one eye. Since his foot had been that way since birth or nearly so, it didn’t slow him down at all. Birds use their beaks as an appendage for many activities anyway! He did, however, go through a period after the blindness where he was less active. I watched him carefully to see how I could help. Approaching him from the sighted eye was an easy adjustment for me, and gave him more security. For a disabled bird, you may have to think outside of what is recommended for cages, play stands, or enrichment. For example, if a bird is blind, has arthritis, or is missing a limb, work with your veterinarian to consider what an optimal environment looks like concerning cage size, shape, and placement. What modifications cane be made for your bird to feel and be safe? Sometimes, special perches, like corner perches, can be easier for special needs birds to stand on. 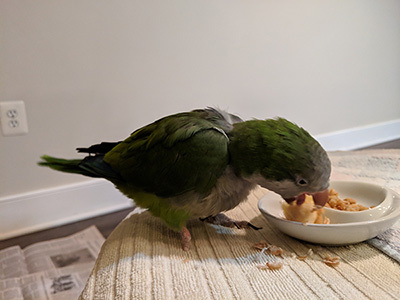 In some cases, a bird who is very challenged with mobility might do better in a space with enrichment and perching opportunities that are low in the cage, to prevent falls. Observing your bird in the cage helps. Can he get around the toys without difficulty? Are there enough perches, in various widths and types, to allow access to the bowls (ideally there are three bowls – water, pellets, and fresh food)? Parrots in general like to hunt (forage) for their food. That is what they would do naturally in the wild. However, foraging might look a little different depending on your bird. Start easy and small – a tasty item covered with a thin tissue for example. It might be that a handicapped parrot wants its environment simple. Making this decision, as with all the choices suggested here, is one that is best chosen by you, as you spend time watching your companion (and keeping in contact with your vet too!). Another option to consider with handicapped birds is the opportunity to fly. As with any parrot, you should always be aware of the environment. Our homes have many dangerous opportunities for a bird, including but not limited to other pets, open water (toilets, tubs, pans), ceiling fans, hot stoves, fireplaces, windows, and doors. My birds have their own room with a door that can be shut, keeping them safe from kitchen, bathroom, and other dangers. If the Quaker falls in the bird room, he can more easily fly to the ground without hurting himself. To allow a bird flight is a very individual decision. Again, checking with your vet first to weigh the pros and cons is essential. Nutrition remains the same for the disabled bird, with one possible exception. A beak injury may require syringe feeding or a mash diet, instead of more whole foods. Please do your best to offer a healthy varied diet, including pellets, seeds & nuts in moderation, and plenty of veggies, fruit, whole grains and omega 3 sources (including but not limited to flax seed, chia seed and walnuts). A yearly visit to your avian vet applies to full bodied and disabled parrots equally. Baseline blood work can help you help your bird through all the transitions of life. Additionally, this visit can alert you to possible deficiencies in your bird’s diet. The most important thing to remember in caring for your bird (handicapped or otherwise) –please give him or her plenty of loving attention, with intention. 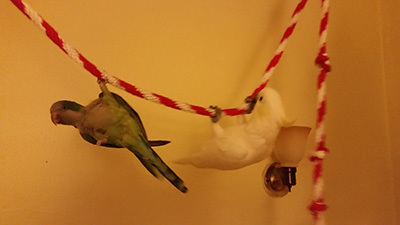 This entry was posted in Parrot care, Special needs birds. Bookmark the permalink. This speaks to my heart. Living with my adopted special needs macaw has been one of the happiest experiences of my life. I was initally daunted at the prospect because I wasn’t sure I had the necessary skills. I worried needlessly. The Phoenix Landing folks immediately set me up for success by providing tips and techniques like those in this article. And Bebé Macaw handles the rest, gently teaching me daily how to best understand and serve her needs. I’m so glad she chose me, she brings great joy every day!! !